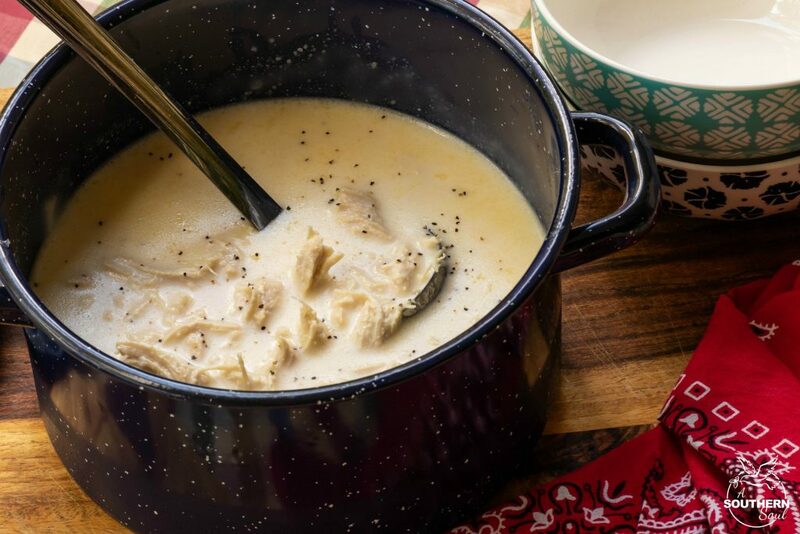 There’s few things as comforting as a bowl of homemade chicken stew. 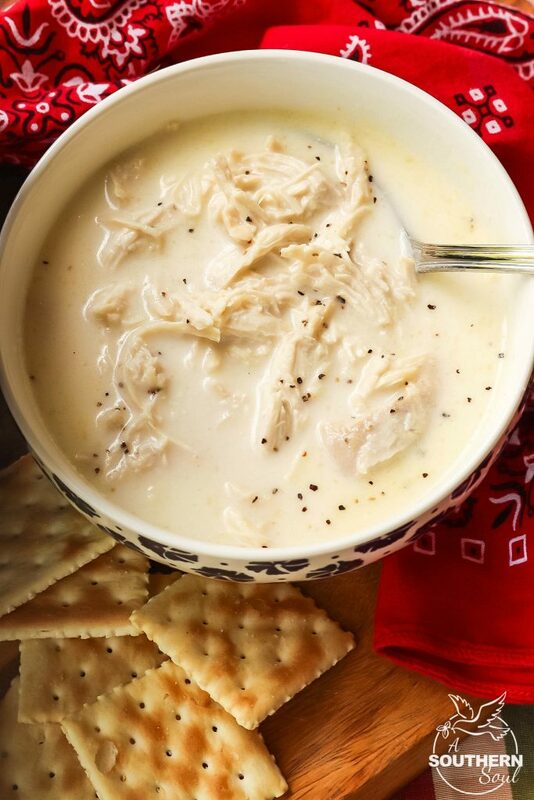 This classic, “Southern Style” recipe has been around for generations. 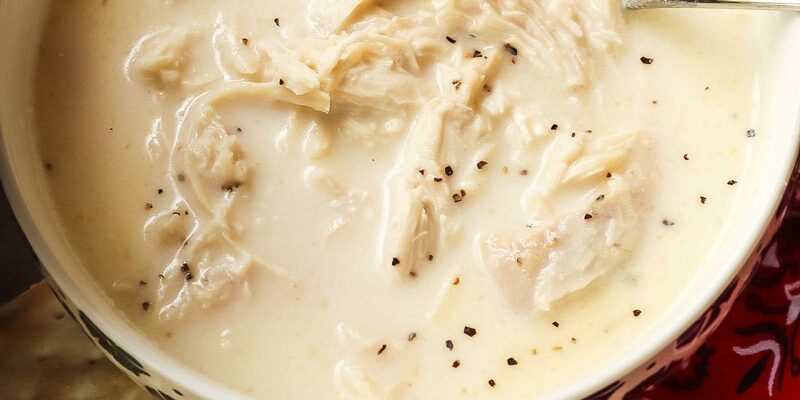 It’s full of tender chicken in a creamy broth seasoned with salt and pepper. It’s simple, straightforward and absolutely delicious! 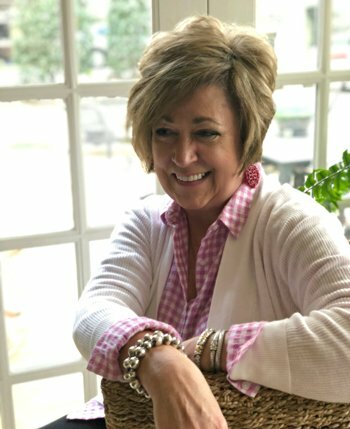 The first time I had chicken stew was a church gathering when I was a little girl. It was late fall, so the air was crisp and perfect for enjoying a bowl of soup. I remember watching the folks from church working around a huge, black, cast iron pot that was hanging over a fire. They would stir the concoction in the pot, slowly feeding the fire so that the coals burned hot. They moved at an easy pace, making sure everything worked in perfect harmony. I was totally mesmerized. I had no idea what was cooking in that pot but I knew it was something special and was going to be powerfully good. 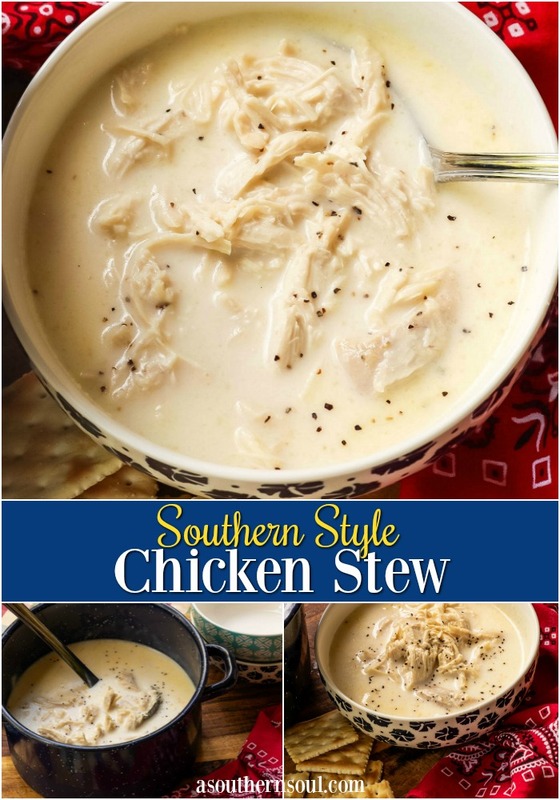 Over the years, I’ve had the pleasure of enjoying many a bowl of that amazing chicken stew. For me, the real success of this dish is how simple and uncomplicated it is. It has just a few ingredients and doesn’t need any extra toppings. 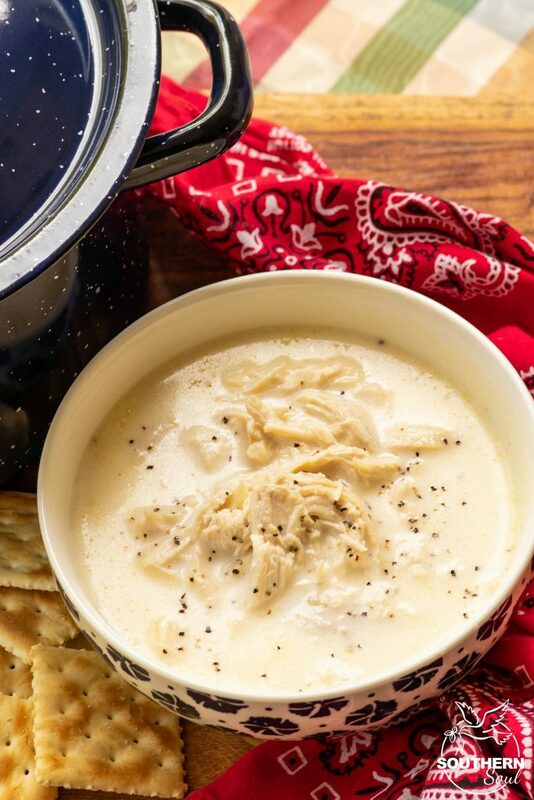 It’s best served steaming hot with saltine crackers. Not fancy crackers, just a plain ‘ol sleeve of saltines. You can add a dash of hot sauce though, if you want to get fancy. It’s a bowl of goodness that can stand on it’s own. It’s as simple as that. What’s funny about this recipe is that for the longest time, I couldn’t find a single “written down” version of how to make chicken stew. 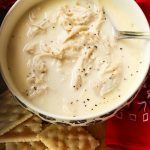 I asked my family, friends and other trusted cooks and I always got the same answer – boil a chicken, add some stock and milk, a little butter and flour to thicken then season with salt and pepper. That’s it. That’s all I got. So, after all of that, I took it upon myself to get an actual recipe together. It wasn’t very hard, and my taste testers were happy for me to experiment on them. 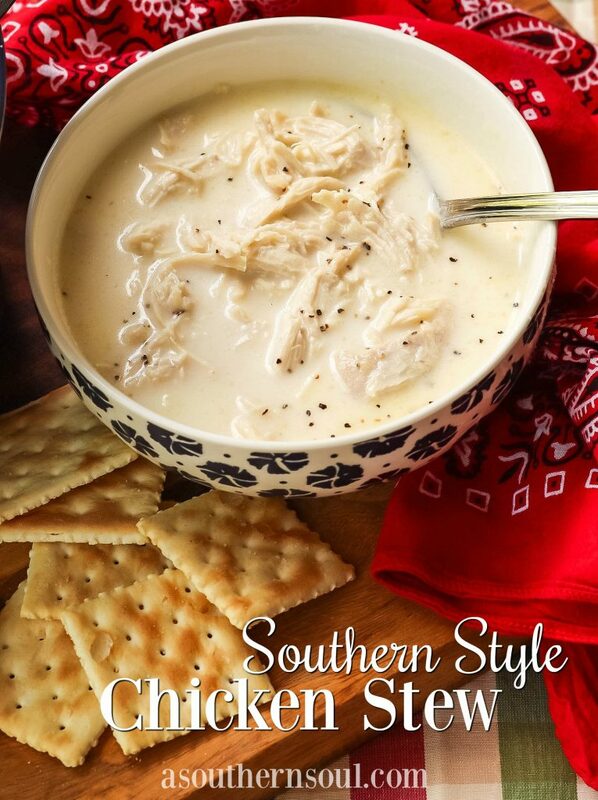 Southern Style Chicken Stew is a time honored, classic recipe that everyone should have in their recipe box. It’s easy to make since it’s really more of a cooking method than a recipe. For me, it’s a dish that brings back happy memories. Simple times, simple food. Add chicken to a large stockpot with enough water to cover. Simmer until tender, about an hour. Remove from the pot, reserving 2 cup of cooking liquid. When chicken is cool enough to handle, remove skin and meat. Discard skin. Shred meat and return it to the cooking liquid. Add chicken stock then bring liquid to a simmer. In a small bowl or cup, mix together flour, milk and butter. Gently spoon into simmering liquid and stir until incorporated. Add milk and stir. Taste and add additional salt and pepper if needed. 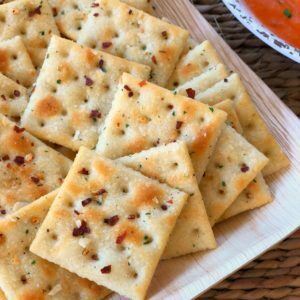 Serve hot with a dash of hot sauce if desired and saltine crackers. 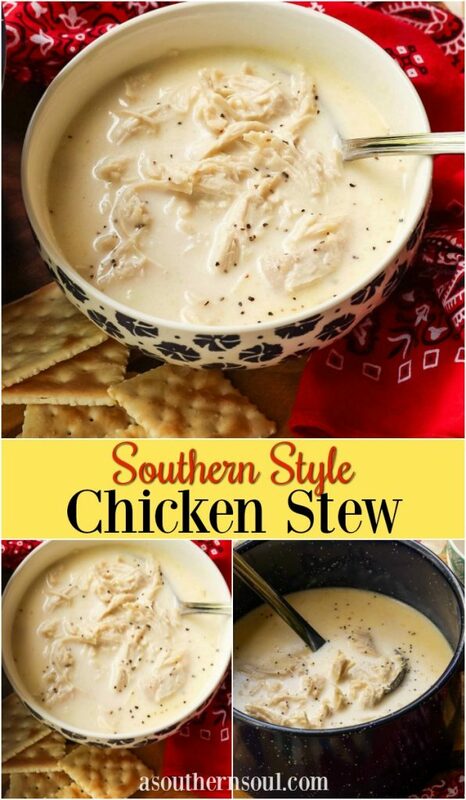 Make sure to FOLLOW A Southern Soul on Pinterest for more great recipes like this one! Where has this been my whole life? I neeeeeeeeeed some of this! 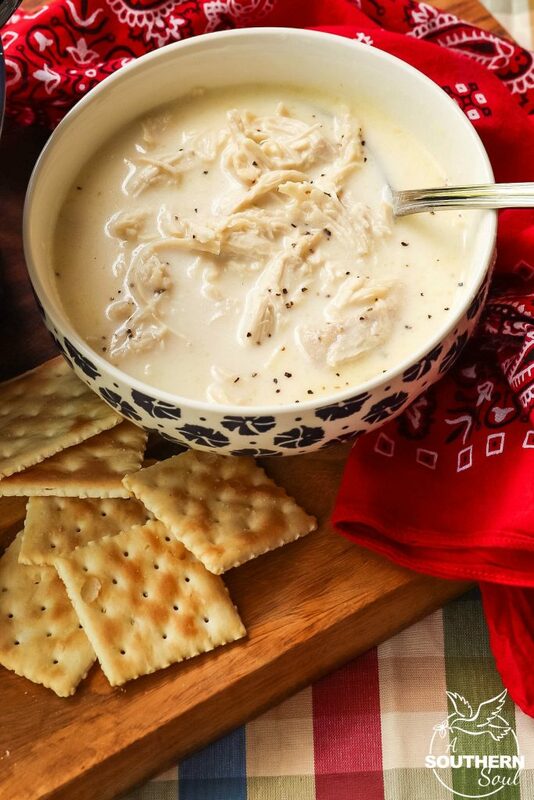 This is comfort food for the win! Looks so warm and cozy! 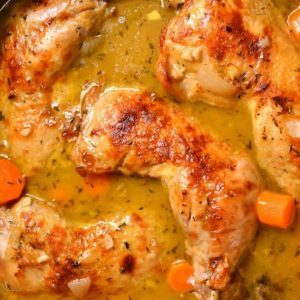 Can you use boneless chicken thighs for this recipe? Yes, Karen! I think chicken thighs would be great. Let me know how you like the recipe. This is a must-try! This is an ultimate comfort food! I put instant mashed potatoes in it to thicken it up and it really makes it good! What a great twist on a classic recipe. I love your idea, Sherri! Keep those good ideas coming.